Melchizedek is mentioned only two times in the Old Testament. But all of Hebrews Chapter 7 is about him! Seven times the Bible tells us that Jesus is "a priest after the order of Melchizedek"! Who is this Melchizedek? He must be important if the priesthood of Jesus is patterned after him. This book approaches Melchizedek as a character study. It reviews every attribute about him that is found in the Bible and examines each one. There IS a reason why Jesus is patterned after the priestly order of Melchizedek. The answer will surprise you! If you have ever wondered about this enigmatic figure, then this book should pique your interest. Christians who want to understand Jesus better. 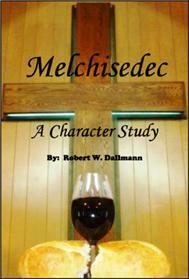 Preachers and teachers who may never have considered this mysterious figure, Melchizedek. A helpful discussion prompt with Jews and Muslims. In this sense useful for evangelism. Robert Dallmann has been a follower and servant of Jesus Christ since December 1983. Currently a director of ChristLife, Inc, an elder in his home church, and a bible teacher. He also has an online ministry in Christian forums such as the forums on Linked-In. UK Customers can buy the book by clicking the Buy button below.